Qui aurait pu prédire qu’un petit site français entièrement consacré à Jaws 3D puisse un jour obtenir la participation des principaux responsables de ce classique du cinéma de genre? A part moi, pas grand monde! C’est donc au culot que j’ai contacté le scénariste (et réalisateur du génial Caveman) Carl Gottlieb m’attendant à essuyer un énième refus. Il faut savoir que 70% de mes demandes d’interviews se soldent par un échec… A la surprise générale, l’interprète du légendaire Meadows des Dents de la mer a accepté sans la moindre hésitation, ne s’attendant certainement pas à recevoir des questions aussi…pointues! Autant dire que vous allez apprendre des tonnes de choses! Comme d’habitude, je vous déconseille d’utiliser la traduction automatique (DON’T USE GOOGLE TRANSLATION) et je vous prie d’excuser mon niveau d’anglais faiblard… Bonne lecture et encore merci à Mr Gottlieb! 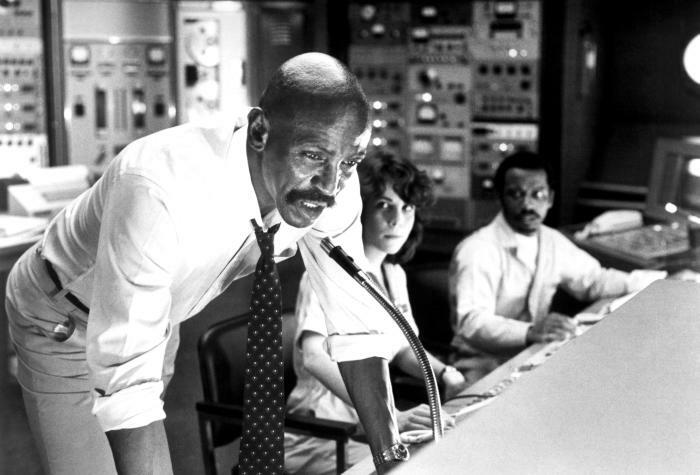 1/ In the movie, Lou Gossett Jr call Fred (the technician) “nephew” . This word is missing in the Final shooting script (September 20, 1982) . Is it an ad-lib? Is Fred really Calvin’s nephew? I WASN’T THERE WHEN THE SCENE WAS SHOT, SO I CAN’T SAY FOR SURE IT WAS AN AD LIB, BUT I’M PRETTY CERTAIN IT WAS. « FRED » ISN’T REALLY A NEPHEW (TO MY KNOWLEGE), BUT THE LINE EXPLAINS ANOTHER BLACK FACE (BESIDES MR. GOSSETT) IN THE ALL-WHITE CONTROL-ROOM STAFF ENVIRONMENT. 2/ Some people argue that Jaws 3D deals with revenge. Do you agree with that? For me, it’s not the baby shark’s death who push the Mother shark to attack the undersea kingdom visitors. It’s Calvin’s fault who have given the order to shut the pump down (where the animal was hidden). YOU HAVE IT EXACTLY RIGHT. THE SHARK NEEDS A FREE RANGE, AND WHEN THE PUMPS ARE SHUT DOWN, IT GETS ANGRY. 3/ Could you tell me more about the stand-off game? Does this game really exist? ABSOLUTELY. I ADDED THAT TO THE SCRIPT FROM MY OWN EXPERIENCE; IT’S A GAME PLAYED IN COLLEGE AND IN THE ARMY, WHERE YOUNG MEN AND WOMEN ENJOY THE PHYSICAL AND MENTAL CHALLENGES. A GAME OF SKILL, NOT STRENGTH. 4/ The Castellari’s movie Great White (a Italian Jaws rip-off from 1982) have some similarities with Jaws 3D. At the end of this poor movie, a dead man with a bomb on him (like the corpse of FitzRoyce) is used to kill the shark by the hero. Were you aware of that? NO, I WASN’T. I DON’T RECALL THE « GREAT WHITE » MOVIE EVEN PLAYING IN THE U.S. MARKET. IF IT DID, IT WAS A LOW-BUDGET RELEASE, NOT IN MANY THEATERS. 5/ Some people from the gay community speak a lot about the “relationship” between Jack Tate & Philip FitzRoyce. Tell us the truth! NO GAY SUBTEXT WAS INTENDED. TATE WAS SIMPLY A LOYAL SUBORDINATE, A HELPER. IN THE ORIGINAL « JAWS, » QUINT HAD A MATE NAMED « HERSHEL, » WHO DISAPPEARED IN MY REWRITE (HE CAN BE SEEN IN A FEW SHOTS, WITH A LITTLE DOG). THIS WAS LIKE THAT. FITZROYCE WAS THE ARISTOCRATIC PUBLICITY-SAVVY « ARTISTE, » AND JACK TATE WAS THE COMMON WORKER WHO DID HIS GRUNT WORK. THEIR COMMON BOND IS THE RELATIONSHIIP OF MEN WHO HAVE FACED CHALLENGES AND HARDSHIPS TOGETHER AND WON. 6/ I really love the dialogues of Jaws 3D. My favorite one is the “Just Throw it in my eyes, it’ll work faster” of John Putch. I think about it every morning! 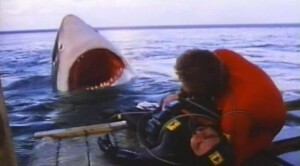 The dialogue in Jaws 3D are funny, all the characters are believable… how do you judge the quality of these dialogues? Who is your favorite character in the movie? I REALLY LIKED JOHN PUTCH & LEA, SO THEY GOT A LOT OF GOOD LINES. AND I LOVED LOU GOSSETT, AND TRIED TO MAKE HIM A GOOD MAN AT HEART, BUT COMMITTED TO BUSINESS SUCCESS AT ALL COSTS. I ALWAYS TRY TO CREATE CHARACTERS WHO HAVE PURPOSE AND COMMITTMENBT TO SOME IDEAL: BESS ARMSTRONG IS AN ENVIRONMENTALIST, DENNIS QUAID IS A TECHNOCRAT, PUTCH AND THOMPSON ARE FUN-LOVING YOUTHS WHO ENJOY THEIR PHYSICALITY AND SEXUALITY, GOSSETT IS THE SOUL OF MODERN COMMERCIALISM, EMPLOYING TECHNOLOGY AND CROWD PSYCHOLOGY TO MAXIMIZE PROFITS. 7/ Your script contains a scene (the bumper boat scene) where a man is eaten by the shark. This death no more exists in the movie. Universal has asked you to alleviate some violence in the movie for the PG rated or Sea World did not want that any fictional Sea World visitor could be deadly hurt in Jaws 3D? I THINK THE DECISION WAS THE STUDIO’S– SEA WORLD DIDN’T HAVE MUCH INPUT ONCE THEY REVIEWED SOME VERSION OF THE SCRIPT (NOT MINE), AND APPROVED, OR « SIGNED OFF » ON THE PROJECT. THE RATINGS ARE HUGELY IMPORTANT, BECAUSE ANYTHING MORE RESTRICTIVE THAN « PG 13 » PUTS LIMITS ON THE FILM’S POTENTIAL AUDIENCE, THEREBY AFFECTING ITS COMMERCIAL POTENTIAL IN EXHIBITION. 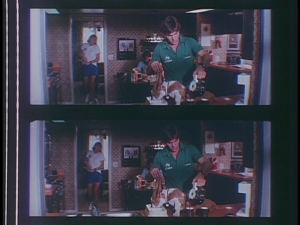 8/ How many years between the events of Jaws 2 and Jaws 3D? More than the five years between the releases of Jaws 2 (1978) and Jaws 3D (1983) I guess… Is this small inconsistency has hampered you in the writing of the script (the characters who grown faster that the audience). I TRIED TO BE CORRECT IN MY CHRONOLOGY… IN « JAWS 2, » THE BRODY BOYS ARE TEENAGERS, THEN 5 OR 6 YEARS LATER, THE OLDER ONE HAS FINISHED ENGINEERING SCHOOL AND HAS BEEN WORKING IN THE FIELD, WHILE MIKEY,THE YOUNGER BROTHER, IS NOW IN COLLEGE. DENNIS QUAID DOES SEEM TO HAVE AGED FASTER, I AGREE. BUT THAT’S CASTING, NOT WRITING. 9/ Do you feel as Jaws 3D is a bit of a science fiction movie, a futuristic movie (submarine where you can speak underwater, complex room) ? WE EXTRAPOLATED FROM WHAT WAS ALREADY THE REALITY OF THE SEA WORLD AMUSEMENT PARK IN ORLANDO, FLORIDA, WHERE THE FILM WAS SHOT. IN THAT REGARD, IT WAS A LITTLE LIKE SCIENCE FICTION. ESSENTIALLY, WE FIGURED OUT WHAT ELEMENTS COULD BE BELIEVABLY ADDED TO MAKE IT A SPECIAL PLACE. 10/ A last thing… Let us dream… Jaws the revenge is a bad movie. 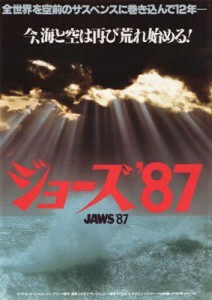 Back in the 80’s If you had the opportunity to write or make Jaws IV. What kind of story for the sequel? Do you reused the characters of the third? IF I WAS TO DO A JAWS SEQUEL, I’D STAY WITH THE SHARK AND THE NORTHEAST COAST OF NORTH AMERICA. I WOULD ABANDON THE BRODY FAMILY, AND DEVISE A NEW SET OF CHARACTERS WHO WOULD HAVE TO COPE WITH THE ELEMENTAL FORCE OF THE GREAT WHITE. THE CONCEPT OF A DANGEROUS PREDATOR WHO CAN OVERCOME INEFFECTUAL HUMAN BEINGS IS THE BASIS OF ALL HORROR FILMS, AND THE HUMAN’S INTELLIGENCE AND COOPERATION IS ESSENTIAL TO THEIR VICTORY. IT IS THE MIRACLE (AND CURSE) OF EVOLUTION THAT PUNY PRIMATES CAN CHALLENGE A MONSTER AND WIN. AS THEY SAID IN THE 19TH CENTURY, « GOD CREATED MEN, BUT IT WAS SAMUEL COLT WHO MADE THEM EQUAL. » (COLT WAS THE INVENTOR OF THE FIRST SUCCESSFUL COMMERCIAL REPEATING PISTOL, A FIREARM THAT « EQUALIZED » THE DIFFERENCE BETWEEN A SKILLED SWORDSMAN OR ARISTOCRAT WITH A FINE WEAPON, AND A COMMONER WITH A GUN THAT COULD FIRE MULTIPLE SHOTS WITHOUT RELOADING. )IT’S NOT BRUTE STRENGTH THAT PUT HUMANS AT THE TOP OF THE FOOD CHAIN, IT’S OUR ABILITY TO DEVISE CLEVER MECHANICAL »FORCE MULTIPLIERS » TO OUTWIT, OUTFIGHT, AND OUTRUN OUR PREY, AND DEFEAT LARGER, BETTER-EVOLVED PREDATORS. AT THE SAME TIME, THE BY-PRODUCTS OF THAT TECHNOLOGICAL EVOLUTION (C02, TOXIC AIR AND WATER DEPLETION, ETC.) THREATEN US WITH OUR OWN EXTINCTI0N, IN WHICH CASE… THE LAST SHARK IN THE WATER WINS! Merci à Carl Gottlieb! J’espère avoir un jour l’occasion de lui poser une autre série de questions!!! Soyons optimistes! 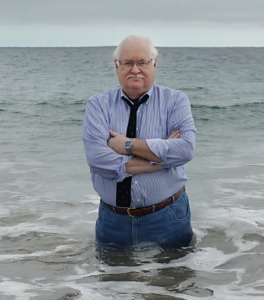 Partager la publication "Interview exclusive de Carl Gottlieb"